Dallas/Ft. Worth, TX—For the past four decades, the widely popular “BE” series, a set of more than 50 Bible studies by Dr. Warren W. Wiersbe, has sold over four million copies and led untold numbers deeper in their walks with God. This summer, a new generation of readers will have the opportunity to discover the best-selling commentaries as David C Cook introduces an updated and revised edition of eight volumes of the “BE” series. A man who has given his life to a deep examination of the Word of God, Dr. Warren W. Wiersbe is an internationally known Bible teacher, former pastor of The Moody Church in Chicago, and the author of more than 150 books. For ten years he was associated with the Back to the Bible radio broadcast, first as Bible teacher and then as general director. Dubbed by many as the “pastor’s pastor,” Dr. Wiersbe skillfully weaves Scripture with historical explanations and thought-provoking questions, communicating the Word in such a way that the masses grasp its relevance for today. 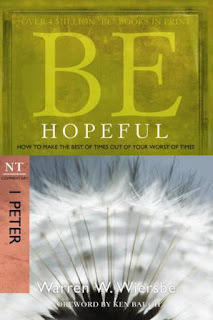 Acclaimed worldwide as a pastoral resource for international leaders, the “BE” series will soon include companion study guides—the Wiersbe Bible Study Series—with each study guide correlating with the appropriate “BE” book. David C Cook plans to release additional editions of the series over the next few years. Long time no read, sorry just caught up in life. This looks like a really good book and I need to check it out.